The White House's immigration framework would substantially reduce legal immigration to the United States over the long-term, according to analyses issued by multiple think tanks in the days following the framework's public release. The plan, rolled out last Thursday, would grant amnesty and a path to citizenship for 1.8 million illegal residents who arrived to the United States as children. That includes the approximately 800,000 individuals who were protected by the Deferred Action for Childhood Arrivals (DACA) order under President Barack Obama, as well as an additional million who would have been DACA-eligible but opted not to apply for the program. In return for the DACA amnesty, the plan, if implemented as law, would end the so-called diversity visa lottery and severely curb chain migration, removing categories of extended family migration. Notably, those applicants already seeking to immigrate under the existing family sponsorship rules would be allowed to stay on the waiting list, slowing the end of such immigration. The plan would also establish a $25 billion trust fund to be used for border security, including a physical border wall. 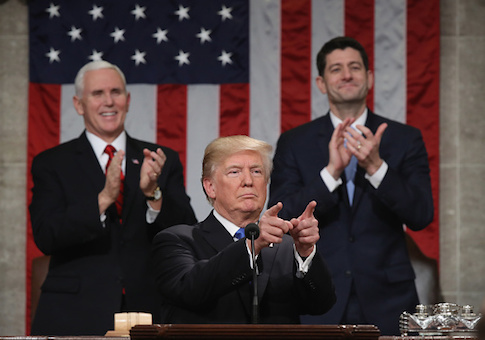 President Donald Trump called for Congress to adopt his proposal during Tuesday's State of the Union address, reiterating the four "pillars" that make the plan, in his view, a bipartisan compromise to finally reform America's immigration system. "These four pillars represent a down-the-middle compromise, and one that will create a safe, modern, and lawful immigration system," Trump said. "For over 30 years, Washington has tried and failed to solve this problem. This Congress can be the one that finally makes it happen." The proposal would be the "largest policy-driven legal immigration cut since the 1920s," according to the analysis released Monday by the pro-immigration Cato Institute. The report, authored by Cato scholars David Bier and Stuart Anderson, found that the administration’s plan, if implemented, would eventually reduce the number of legal immigrants by 490,000 people annually, down from just over 1.1 million to approximately 600,000, a 44 percent reduction. Those cuts would come initially from the ending of the "parents of citizens" and "spouses and minor children of residents" categories of chain migration, as well as ending the diversity visa lottery and cutting the number of asylees. Bier and Anderson then expect a phase-out period of between 10 and 50 years for the remaining family-sponsored immigration categories, as the backlogs for those applicants are cleared. All of this adds up, they argue, to an estimated 22 million people who would otherwise immigrate being denied entry into the United States over the next 50 years. This is, in their view, a wrong-headed approach to immigration policy. "The United States needs legal immigrants to maintain a strong rate of current economic growth and stay competitive internationally," they write. "Real ‘merit-based' immigration reform would focus on increasing the number of immigrants at both ends of the skill spectrum to fill difficult manual labor jobs as well as contribute to technology, science, and finance. The White House proposal is the opposite of the reforms that would lead America toward prosperity." Bier and Anderson's analysis was challenged by Jessica Vaughan, director of policy studies at the immigration-restrictionist Center for Immigration Studies (CIS). She argued that the Cato study failed to account for long-term temporary visas offered to parents of U.S. citizens, a feature she said is included in most major immigration proposals. She also claimed that the immigration backlogs would take much less time to clear than Cato predicted. "Even if their analysis were correct, I would disagree that such steep immigration reductions would be bad for the country," Vaughan told the Washington Free Beacon. "On the contrary, it would likely boost prosperity and well-being of Americans and other residents by slowing down the inflow of less-educated and less-skilled workers; reducing future demands on schools, hospitals, and public assistance; and moderating population growth, which has caused crowding and strained our natural resources." In its own analysis, released Wednesday and authored by Vaughan, CIS emphasized that the reduction in immigration will take some time to offset the amnesty that the White House also wants. Using slightly different numbers than Cato, CIS found that the cuts to chain migration would reduce immigration by about 18 percent in the short term, and 33 percent after ten years (when expanded reductions in chain migration begin to kick in). The CIS analysis assumes that the immigration backlog will take less long to empty, but it is likely that that 33 percent reduction would not happen immediately after 10 years given those applicants grandfathered in. Declines in immigration will further be offset by granting an amnesty to 1.8 million DACA-eligible immigrants, CIS argued. Vaughan estimates that it would take approximately 15 years for the chain migration cuts to offset the amnesty-produced green cards. This timeline may be exacerbated if some form of residency option is provided for parents of citizens, which CIS says could eventually double the size of the amnesty. "In other words, there would be instant deportation relief for 1.8 million illegal aliens, but a very long wait for immigration relief for Americans," Vaughan writes. Bier, speaking to the Free Beacon, suggested that CIS may be overcounting issued greencards in the "spouses and minor children of citizens" category, and further downplayed the trade-off that the 1.8 million person amnesty implied. "Under my analysis, you would have nearly twice as many legal immigrants being banned as illegal immigrants receiving amnesty under the Trump white house framework," Bier said. "You’re gonna have a minimum, even under their estimate of 2 million people over ten years being banned from entering as legal immigrants. The idea that you're going to have to wait a long time for this to kick in is just not true. Ten years is a relatively short period of time, and you're going to have more people being banned, a lot more people being banned, than receiving any kind of legalization under the Trump administration proposal." The White House's proposal has earned the backing of congressional immigration hardliners, such as Sens. Tom Cotton (R., Ark.) and David Perdue (R., Ga.). But it has been attacked by many on the left, with House Minority Leader Nancy Pelosi (D., Calif.) slamming it as a plan to "make America white again." It has also been strongly criticized by some of the right's most stringent anti-immigration voices, including Mark Krikorian, executive director of CIS. What is clear from recent survey data, at least, is that Americans want less immigration. A recent poll found that 81 percent of Americans want a rate of immigration lower than the 1.1 million immigrants who arrived to the United States in fiscal year 2016. UPDATE 7:10 P.M.: A quote from David Bier was corrected to clarify that he said the proposed policy would reduce legal immigration. This entry was posted in Issues and tagged Illegal Immigration, Immigration, Immigration Reform, White House. Bookmark the permalink.